From Shanna the She-Devil #1 -1972 - the idea has been around for a while! Jurassic Reich started as a single session game about 12 years ago with my then regular Friday night group. I’d knocked out some quick rules and a scenario for plastic army men – the Allies were attempting to destroy a secret Nazi laboratory that was breeding dinosaurs. I’ve always had a thing about dinosaurs, I feel that any game is better with them! 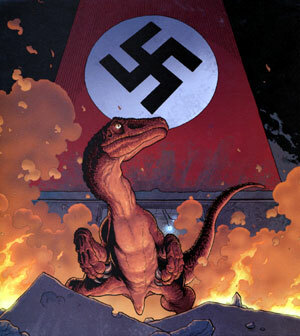 And how can you go wrong with a game about Nazis on dinosaurs? So fast forward to a few weeks ago, just after Little Wars 2009 Melbourne. I ran a game for Eureka Miniatures, Teddies of the Caribbean, featuring Eureka’s Teddy Bear Pirates. Afterwards I put together a list of suggestions for next years game, including my old Jurassic Reich scenario. Coincidentally, Kosta Heristanidis had just made a lovely line of pulp WW2 GIs for Eureka, which would be perfect for the Allies. Nic Robson then asked Alan Harrision, who had made the beautiful London terrain board for last years Little Wars game, if he would make the terrain for Jurassic Reich. As it happens, Alan is into Weird War 2 stuff at the moment, so he was most enthusiastic. So that is that! as they say- Alan has already started on the castle for the table, and you can view his progress here. Nic and Kosta are working on dinosaurs. As for me, I simply have to design the scenario and rules! But I’m waiting to see how the table and terrain evolve – its quite exciting working with Alan, because we are developing the scenario and the terrain hand in hand. In adition to the actual scenario, we’ll be fleshing out the backround and world of Jurassic Reich – people, places, events will also be part of the fun. We’d love to hear your comments and suggestions! Leave a comment, or email: jurassicreich@gmail.com . This is one of the BEST ideas I’ve seen in a long time. I echo Jim’s comment. PS: I just got back from running a historical F&I game at “Little Wars” in Chicago, Illinois (USA). Small world.